There are a number of add-ons to the famous browser, Mozilla Firefox, which you can use to improve the browser performance. We present our add-on to Firefox, Handy Password manager, with help of which you can greatly elevate the quality of your Firefox browsing. The Handy Password add-on adds to Firefox several useful features which you are sure to appreciate while using the browser. You are now able to login with one click. Just add the Password toolbar button to your toolbar. To start with, Handy Password adds to Firefox a bookmark toolbar through which you can quickly assess you favorite Internet pages. Another useful feature of our Firefox add-on is the fill in form function that allows you to automatically fill in forms anywhere on the web. What is more, with the help of this Firefox add-on you can save all your personal information to a secure database where it will be stored under the protection of your master password. 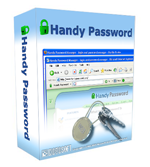 In Handy Password manager, you personal information is grouped into categories such as email, finances, shopping etc. The add-on automatically determines which information is required for a particular form, completes the form and submits it quickly and hassle free. The Firefox password addon is implemented in the form of a browser toolbar with adds special Save and Fill buttons. Whenever you enter your personal information on the web, you can click the Save tab on your browser toolbar. The information you have entered will be saved to a secure password storage database. The next time you visit this webpage, you only need to click the Fill button to complete all the fields automatically. There is also the autosave function of which you can make use to automatically fill in a form as soon as the web page is downloaded. Download Password manager and enjoy the best Firefox add-on!